Many people only associate gum disease with older adults because they wrongly assume that most dental problems occur in “old age.” However, children and adolescents are also at risk for developing gum disease and other oral health problems. Gum disease in children typically presents itself in the same manner of symptoms as adults: red, swollen, tender gums; gums that bleed easily; receding gum lines; and persistent bad breath. Any of these symptoms should be brought to the attention of your child’s dentist so that intervention can begin in a timely manner in order to avoid serious oral health issues from becoming a big problem. Gingivitis is the most common form of gum disease in children, and it is the first stage in periodontal disease. Genetics plays a large role in determining whether children are at risk of developing gum disease. Children whose parents are plagued by gingivitis or severe periodontal disease have a higher risk of having the bacteria within their mouth that can lead to increased gum infections. 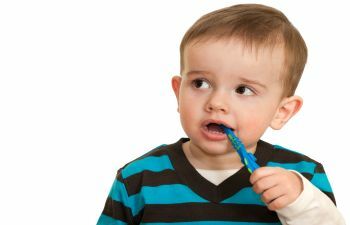 Parents who are prone to gum disease should speak with their children’s dentist to discover proper dental hygiene techniques that can prevent gum disease from plaguing their children. Hormonal changes can also make children more prone to gum disease. Just as with pregnant women, huge fluctuations of hormones can leave the gums vulnerable to infection. Teenagers experience large hormonal fluctuations that make their gum tissues even more sensitive and easily irritated by plaque and bacteria than they normally are. It is important for parents to encourage their developing teens to properly care for their teeth and mouth as they adapt to the changes in their bodies. Poor dental hygiene is the leading cause of gum disease in people of all ages. Children must be taught at a very young age how to properly care for their teeth, so that when they are old enough to be responsible for their dental health they know how to handle it. With good oral hygiene habits practiced on a daily basis and regular dental visits, children can reduce their risks for gum disease. At Gold Hill Family & Cosmetic Dentistry, we are here for the dental care needs of your entire family. Please contact our practice today to schedule an appointment.